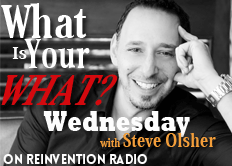 In his book, What Is Your WHAT? Discover The One Amazing Thing You Were Born To Do Steve points out that on the cover there is one graphic element — a DNA symbol. He believes that you can choose your WHY but your WHAT has chosen you. You have a core gift to share with the world. Steve goes on to share a story about his son and his strong ways since birth. Most recently he went to a birthday party and was a bit distraught when he did not get invited to the sleepover portion. Steve solicits input from Mary and Rich as to how they would handle the situation.